Is there something going on with your office or house plants? They are declining, but you can’t figure out why? If there has been no change in the plant’s environment or care, you may have an insect issue. Insects on tropical plants can be very hard to detect in the early stages. It is often not apparent until a full-blown infestation is present. Regular inspection for evidence of insects should be part of caring for indoor tropical plants, whether in your home or office. A trained horticultural technician knows the signs. When caught early, nearly all insect problems can be resolved quickly and before there is damage to the plant. The most common pests found on indoor tropical plants are spider mites, scale insect, mealy bug, fungus knats and thrip. Less common are aphids and whitefly. These last two are most often associated with outdoor flowering tropical plants such as hibiscus. They become a problem with the plants are brought in for the winter and may spread to other indoor plants. This blog will talk about spider mites, scale insect and mealybug. Check back at the end of the month for information on the others. Spider mites are very tiny, most often white (can be red or black too) insects that attack many tropical plant species. Most commonly, they are seen on ivy, schefflera, and many species of palm. Often it is the damage to the leaves that is noticed first. The leaves will appear mottled, and lose their green colour. On closer inspection, you will see very fine webs between the leaves, or between the leaves and the petioles. In heavy infestations, you will see the very tiny mites on the webs. Mites occur when the plant has been to dry or hot. Plants kept in windows, in direct sunlight will often develop mites. The image at the top left shows a leaf with typical damage from spider mites. Spider mites can be prevented by weekly cleaning of the plants with a damp rag. Infestations can be treated this way as well. 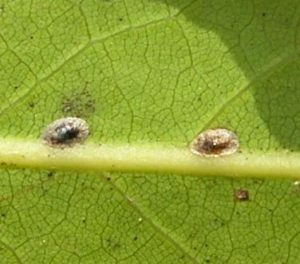 Scale insect appears as raised brown bumps, typically on the undersides of the leaves. They may occur in clusters, and may spread to the petioles and stems. One of telltale signs is a clear sticky substance on the leaves, and in severe cases, it may drip onto the pot and floor. Again, routine cleaning will detect and help prevent scale. If you see it, remove with a damp rag. A mild dishsoap may help. They are quite stubborn, so you may have to apply pressure with the rag to wipe them off. Spraying the plants occasionally with a leaf cleaner or leaf shine product may discourage scale. 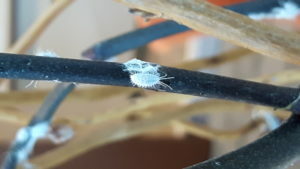 Mealybug is another common plant insect. As with spider mites, they tend to appear when the plant has been stressed from dry hot conditions. They can infect most plants, but are commonly seen on pothos, schefflera, bird of paradise, and some species of palm. They appear as sticky, fluffy, white ‘cotton’ on all parts of the plant. If detected early, they can be wiped off before they spread. Prune off badly infected parts of the plant. Commercial insecticidal soap may be effective, as are leaf cleaners that contain silicon or neem oil. In summary, proper care will prevent most insect problems. Having a professional plant care service means that the plants in your office will be cared for regularly and properly. If an insect does appear, it will be recognized and treated immediately, before it can damage the plant or spread to other nearby plants. Insects on tropical plants are manageable.